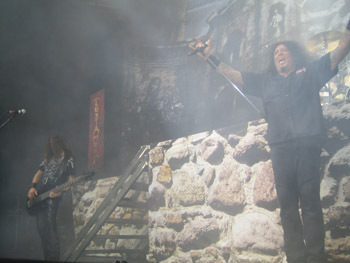 On Tuesday, August 31, 2010 Testament played Daly City’s 10,300?seat capacity Cow Palace with 8,000 tickets sold. Testament, who opened for co?headliners Megadeth and Slayer, played a 10?song, 52-minute set from 6:55 to 7:47. -For the Glory Of … (The Formation of Damnation, 2008). The show began with a pre?recorded tape track of For the Glory Of …, the instrumental first song from the band’s latest record. 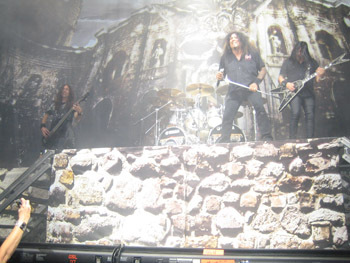 The band members walked on stage and took position on a gothic?themed stage that included a (1) tarp backdrop depicting a castle featuring the band’s demon mascot featured on The Legacy record cover (1987) and (2) stonework facade for Paul Bostaph’s (“PB,” drummer) 48?inch high drum riser and 48?inch high platform positioned 36 inches further back from PB’s drum riser that stretched to the ends of the large stage. Two banners bearing the band name in yellow lettering against a maroon background were hung on the far ends of stage left and right. Six metal steps on each side of PB’s riser led up to his riser. For the Glory Of … led straight into More than Meets the Eye. 1. 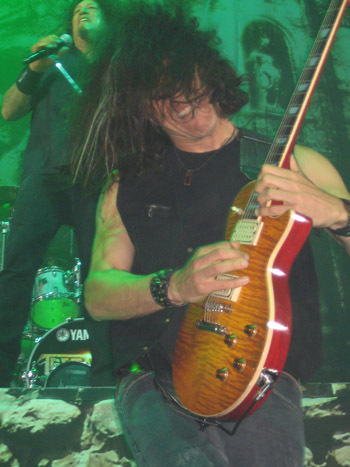 More than Meets the Eye (The Formation of Damnation, 2008) began with two bars of Alex Skolnick (“AS,” lead guitarist) and Eric Peterson (“EP,” lead and rhythm guitarist) catchy, mid tempo guitar riffs augmented by PB’s heavy?handed drumming. 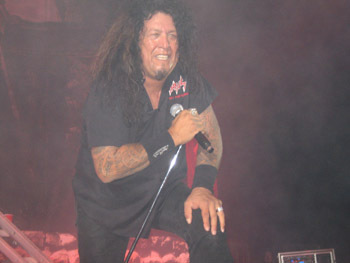 Chuck Billy (“CB,” vocalist) joined in for the remaining two bars by replicating the catchy melody with “whoas” while PB bashed away on his tom?toms and bass drums. CB wore black sneakers, black denim slacks, black short?sleeve button?down cotton shirt with a red “Sadus” logo on the left chest, and wide black sweatbands on his forearms. The tempo then escalated to an up tempo pace when AS and EP began playing chugging, palm?muted guitar riffs with sporadic trills that they continued to play when CB sang the first verse in a thrash tone. AS and EP once again played two bars of the catchy guitar riffs from the introduction during the 10?second musical interlude between the first and second verses. 2. Dog Faced Gods (Low, 1994). The first 10 seconds of Dog Faced Gods featured AS and EP’s frenetic guitar riffs augmented by PB’s drum fills. AS and EP then played up tempo, chugging guitar riffs for 15 seconds that PB played in tandem on his snare drums followed by dual melodic guitar notes for five seconds. CB then sang the first verse in a death metal tone while AS and EP resumed playing chugging guitar riffs. AS and EP played melodic guitar notes during the seven?second musical interlude between the first and second verses. CB then sang the second verse followed by the first chorus during which he switched from a death metal tone to a fairly high?pitched octave and twice sang, “Confirm who I am. Contort all I can. Conceive sorcery. Corrodes disbelief.” AS and EP’s guitar riffs and PB’s drumming during the first chorus replicated the melody that was a bit too stilted and inconsistent with the first verse’s driving tempo. AS and EP resumed playing the up tempo chugging guitar riffs from the introduction during the 10?second musical interlude between the first chorus and guitar solo. The tempo then slightly decreased for 45 seconds during which AS and EP played heavy guitar riffs with flanger effect for 20 seconds followed by AS’s 25?second scalding guitar solo augmented by EP’s heavy guitar riffs. AS wore off?black denim slacks, black muscle shirt, black cotton jacket, and black studded leather bracelet on his right wrist. AS played a vintage (maple) burst Heritage signature model guitar, except during 3 Days in Darkness when he played a tobacco sunburst Heritage or Gibson Les Paul guitar. The tempo then resumed an up tempo pace and the band repeated the first 10 seconds of the song. CB then repeated the pattern from the second verse and first chorus when he sang the third verse and second chorus. 3. The New Order (The New Order, 1988) began with AS’s recurring series of mid tempo high notes while EP played heavy guitar riffs that PB played in tandem on his cymbals and bass drums. The tempo then escalated to an up tempo pace as AS and EP played chugging, frenetic guitar riffs for 10 seconds. AS and EP then switched to playing groove?oriented guitar riffs at a slightly slower tempo but still in the thrash vein that they continued to play when CB began to sang the first verse in a thrash tone. Greg Christian’s (“GC,” bassist) heavy bass line that he played on a black Carvin five?string bass provided a good foundation for the song. GC wore black leather slacks, all-print black and grey Affliction t?shirt, and black leather bracelets on his wrists. CB then sang the first chorus at which point the tempo slightly escalated and AS and EP resumed playing the chugging, frenetic guitar riffs from the introduction. CB then repeated the pattern from the first verse and chorus when he sang the second verse and chorus. The tempo then momentarily slowed down and the band jammed for 70 seconds during which AS played a 50?second guitar solo, EP heavy guitar riffs, GC a solid, groovy bass line, and PB thundering drums. The tempo then resumed an up tempo pace as AS and EP played the chugging, frenetic guitar riffs from the introduction for 10 seconds. AS and EP then played the groove?oriented guitar riffs at a slightly slower tempo that they continued to play when CB sang the third verse. CB repeated the pattern from the first two verses and choruses when he sang the third verse and chorus. 4. Practice What You Preach (Practice What You Preach, 1989). Before Practice What You Preach BI said, “All right! Show us that you Practice What You Preach!” The first five seconds of Practice What You Preach featured one bar of AS and EP’s simple, mid tempo guitar chord progression and PB’s simple drum beat. The tempo then slightly escalated and AS and EP played chugging guitar riffs for 10 seconds. AS and EP then repeated the pattern of playing the simple guitar chord progression followed by chugging guitar riffs, albeit for twice as long and at a slightly escalated tempo. CB then sang the first two verses that featured a catchy melody in a slightly melodic yet thrash tone while AS and EP continued playing chugging guitar riffs. CB then sang the first chorus while AS and EP played descending guitar chord progressions. The tempo slightly decreased for 10 seconds when CB sang the final line of the first chorus (i.e., “practice what you preach”). 5. The Persecuted Won’t Forget (The Formation of Damnation, 2008). Before The Persecuted Won’t Forget CB said, “Yeah! It’s good to be home. I see a lot of familiar faces. Let’s make some noise. This is off the new record, The Persecuted Won’t Forget.” The first 10 seconds of The Persecuted Won’t Forget featured a flurry of EP guitar riffs he played at a dizzying speed after which AS and GC played up tempo, chugging riffs and PB thundering drums with syncopated flashing white stage lights. The tempo momentarily reduced to a mid tempo pace while CB sang the first verse in a thrash tone and AS and EP played chugging guitar riffs. During the 10?second musical interlude between the first and second verses the tempo resumed a frenetic pace while AS, EP, and GC played the riffs from the introduction. The tempo momentarily reduced to a mid tempo pace as CB sang the second verse and first chorus with the latter featuring AS and EP playing EP’s guitar riffs from the introduction, albeit more spaced?out. CB then sang the bridge, which he initially sang in a thrash tone, but that morphed into a death metal tone when he sang the final words of the second line (i.e., “suffocating meeeeeeee!”). The bridge included a 40?second musical interlude during which AS and EP played a combination of the guitar riffs from the first chorus and descending arpeggio notes while standing near the front edge of stage left facing each other. CB, who was standing in front of PB on his drum riser, then sang the remainder of the bridge in a death metal tone and still at a mid tempo pace. AS then played a 40?second guitar solo after which the tempo momentarily resumed its initial frenetic pace and CB repeated the pattern from the second verse and first chorus when he sang the third verse and second chorus while still atop PB’s drum riser. The song ended as it began, with EP’s dizzying guitar riffs and PB’s thundering drumming with syncopated flashing white stage lights. 6. Into the Pit (The New Order, 1988). Before Into the Pit CB said, “F**k yeah! I see a great job in the [mosh] pit. Let’s see if we can get it bigger. This song is called Into the Pit.” The first 20 seconds of Into the Pit featured four bars of AS and EP’s mid tempo guitar riffs. PB’s frenetic bashing of his snare drums then escalated the tempo to an up tempo thrash pace while AS and EP played two additional bars of the same guitar riffs, albeit at a faster pace. CB then sang the first verse in a thrash tone while AS and EP played frenetic guitar riffs. GC’s bass line and PB’s snare drums were particularly prominent during the first verse. During the 10?second musical interlude between the first and second verses AS and EP continued to play the frenetic guitar riffs from the first verse that GC and PB played in tandem on the bass and drums. PB’s drumming was reminiscent of Dave Lombardo’s (Slayer’s drummer) drumming on Slayer’s Reign in Blood record (1986). PB wore knee?length black cotton shorts and black muscle shirt, and he played a massive silver Yamaha drum kit featuring double bass drums and Paiste cymbals. CB then sang the first chorus that was unique because the tempo slightly slowed down for brief periods when AS, EP, and GC chanted, “Into the Pit.” The other chorus lines featured a frenetic pace on the cusp of disarray. [The chorus sounded like a cassette improperly placed in a tape deck causing it to erratically slow down and speed up. But the band’s tight musicianship kept the song together sounding like an angry hornet’s nest that may falsely appear discombobulated but actually guided by a specific goal, to attack those within striking distance.] AS then played a 25?second guitar solo while EP, GC, and PB continued to play at a frenetic pace. The tempo slowed down to a mid tempo pace for 25 seconds during which AS and EP played six bars of the guitar riffs from the introduction prompting the audience to bob their heads in unison to the mesmerizing melody. The tempo then resumed an up tempo pace and CB repeated the pattern from the second verse and first chorus when he sang the third verse and second chorus amidst red stage lights. The band jammed for five seconds after which CB sang the bridge in a death metal tone that included an impressive display of drumming by PB and CB’s catchy chant of “whoa oh oh.” CB then repeated the pattern from the first two verses and choruses when he sang the third verse and chorus while on his knees on the front edge of center stage. The tempo then dramatically slowed down for 35 seconds while AS and EP played four bars of guitar riffs reminiscent of early era Slayer. CB’s growl of “yeahhhhhhhh” marked the resumption of a mid tempo pace and EP resumed playing the guitar riffs from the introduction while AS played a 30?second guitar solo. 9. The Formation of Damnation (The Formation of Damnation, 2008). Before The Formation of Damnation CB said, “What’s up San Francisco?! Are you having a good time? Are you feeling good? I have my money on the Bay Area. So don’t let us down. This song is called The Formation of Damnation.” The Formation of Damnation began with two bars of AS and EP’s combined up tempo, frenetic guitar riffs and chord progressions they played while standing atop PB’s drum riser. The band then stopped playing for one second after which AS and EP resumed playing up tempo guitar riffs that they continued to play when CB sang the first verse in a death metal tone while kneeling on his left knee at the front edge of stage right. CB then sang the first chorus while AS and EP played guitar riffs peppered with trills. CB then repeated the pattern from the first verse and chorus when he sang the second verse and chorus (twice) followed by EP’s 10?second guitar solo on his black Dean flying V guitar with pearl trim and demon logo on the body from The Legacy record cover (1987). EP wore black Converse sneakers, black denim slacks partially covered with black nylon, black short?sleeve button?down cotton shirt, and wide black sweatband on his right forearm. Venue: Cow Palace (“CP”) is an arena located in the San Francisco suburb of Daly City (10 miles south of San Francisco). CP was opened in 1941. It’s name is attributed to the structure’s use to house animal livestock expositions. Depending on seating configuration, CP’s seating capacity varies from 10,300 to 16,500. Artists such as The Rolling Stones, Elvis Presley, The Grateful Dead, The Who, The Doors, Rod Stewart, Santana, ZZ Top, Yes, The Beatles, Neil Diamond, Liberace, Elton John, U2, and Prince have performed at CP. Other notable appearances at CP include those by John F. Kennedy, Evel Knievel, Ringling Bros. Barnum & Bailey Circus, The Royal Canadian Mounted Police, and the Billy Graham Crusade. Opening Band (first to last): Testament itself followed by Megadeth and Slayer (co?headliners) on American Carnage tour. 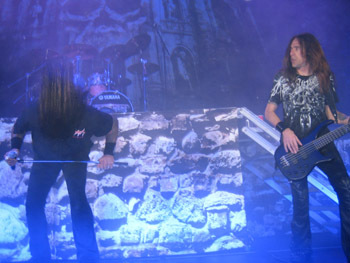 This entry was posted in Concert Reviews and tagged Testament. Bookmark the permalink.